Son Edward L of Nashville, Martin County, real estate comprising the North Thirty (30) acres of the North East quarter of the North East quarter of Section 22 in Township 104 North, Range 29 West, in Martin County. Pam Schuster Offerdahl, Bob Schuster, Karen Gerke, Rita E Sackett and Bridget Schuelke. Darlene Sackett, Teri Stanek, Anna Tabor, Ken Buscho, Name Withheld and Lois Landvoigt. 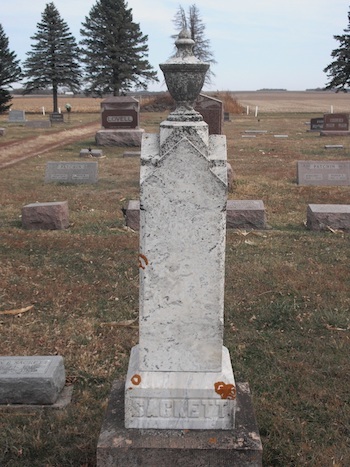 Vital Records, Goodhue County, Minnesota, Death Records: Book 4, page 91, line 15, "Orlin Sackett, male, white, widowed, d. December 13, 1905, age 81 years 2 months 6 days, b. New York, cause of death: pyemia, occupation farmer, d. Pine Island township, parents unknown b. America, attending physician Dr. Matson, Zumbrota, MN." 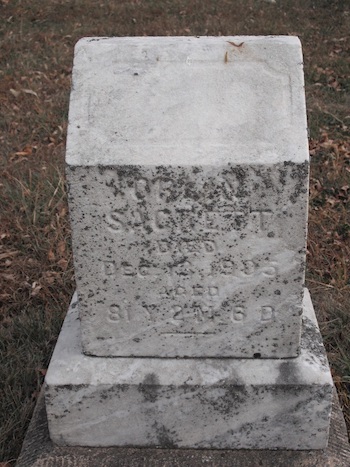 Cemetery Records, Fairview Cemetery, Naples, Ontario County, New York, "Lucinda Sackett Wife of Orlin Died Oct 1856 Age 29-10-6." Ann Elizabeth Hanscom was born in Banhor, Maine, Dec 28th, 1837. When quite young she moved with her parents to Ohio; and from there to Wisconsin; then to Minnesota. In 1860 she was married to Orlin Sackett and settled in Goodhue county. While there she and her husband started in the Christian life and united with the M. E. church. In 1886 they moved to Nashville Center, Martin county, where they have since resided. After a long and painful illness she died Jan. 23, 1890, aged 53 years. She leaves a husband and several children to mourn her death. Sermon by the writer at Nashville Center F. B. church. Text Heb. 6:18. May heaven's richest blessing accompany the bereaved ones. J. M. Young." Vital Records, Levant, Maine, "Anne Elizabeth Hanscum b. December 29, 1838 Levant, Maine." Death 23 January 1890 recorded in Hanscom Family Bible. [Record immediately follows that for Lotas Sacket]. Sarah Sackett, 8, b. NY. "US Civil War draft registrations records 1863–1865", digital image, Ancestry.com, "Sackett, Orlin [name struck through], of Roscoe, Goodhue Co, 37, farmer, b. NY enumerated [presume 1863], 2nd district, Goodhue, Minnesota, white, class I & II, remarks "hernia l"." "Sackett, Orlin, of Roscoe, 37, farmer, b. 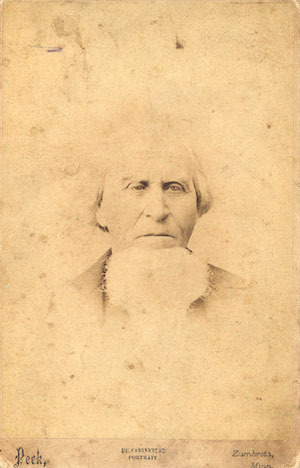 New York, enumerated June/July 1863, 2nd district, Minnesota, white, class II." 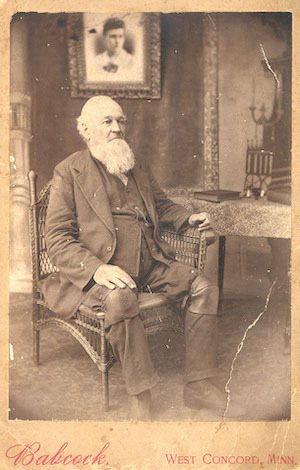 "Minnesota, Wills and Probate Records, 1801–1925", digital image, Ancestry.com.